Six area families will have a bountiful holiday thanks to the Probation Department. 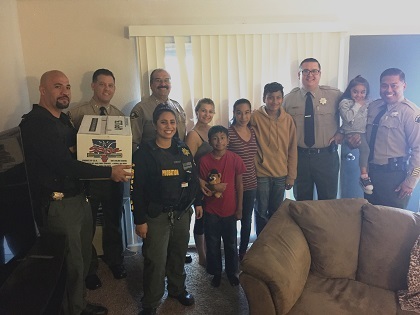 Chief Adolfo Gonzales and Probation officers delivered Thanksgiving meals to families in need last week. Probation partnered with San Marcos Elementary in San Marcos, Lincoln Acres School in National City and Montgomery Elementary School in Chula Vista to select the families. Principals from the schools, which Probation recently adopted, selected students with stand-out records in the classroom. One student hasn’t missed a day of school in a few years. For Chief Gonzales, the mission is personal. Growing up, Gonzales said his own family received donated Thanksgiving meals from the Salvation Army. “Ever since I’ve had the opportunity to give back, I have,” said Gonzales. 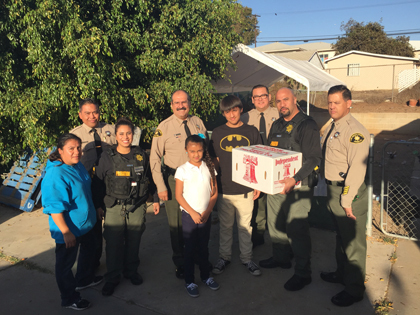 The donations are also about strengthening Probation’s ties with the community. How are you paying it forward this holiday season? Tell us in the comment section below.